Our product range includes a wide range of polysiloxane high heat resistant air drying coating, nano technology based antimicrobial, disinfecting agent, heat reflective & insulating tiles for roof & pavements and transparent heat insulating coating for glass. Packaging Size 1000 ml, 400 ml, 20ltr 200 ltr. We are the manufacturer of Polysiloxane High Heat Resistant Air Drying Coating. Due to high heat, Chimneys, Furnaces, Ovens, Boilers, Burning Stoves, Automobile Mufflers, Industrial Machineries, Plants and Pipes and Other heat producing units gets corroded very fast. It also causes risk of life of the technician and operator who is handling it and also reduces the efficiency of the industrial unit. These exposed materials at higher temperature need thermal barrier for preventing excess heating up and causing risk. 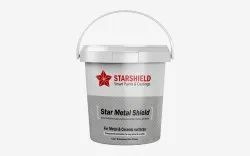 Star Thermal Shield is a Polysiloxane based high heat resistant coating which can resist a temperature up to 600 degrees. 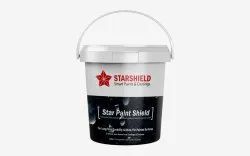 Star Thermal Shield has high durability and self drying property paint. There is no need of baking for curing as it can dry with atmospheric air only. It has low reflectance and has excellent adhesion with GI Sheets, Iron Sheets, Stainless Steels and Casting Iron and Aluminum Substates.Star Thermal Shield is available in both black and silver colors and can be used as a single coat on metal surfaces. Star thermal shield is Polysiloxane based high heat resistant air drying coating. One of the few paints in the world to have the Polysiloxane in it. Available in both black and silver colors. Can be used for Chimneys, Furnaces, Ovens, Boilers, Burning Stoves and Automobile Mufflers etc. A single coat can effectively work. Howit works: Star Thermal Shield forms thin hard coating of Polysiloxane polymer resin on the surface to be treated and provide protection against excess heating. It provides a thermal barrier to the metallic or steel surface. Heat resistant paint upto 600 degrees. Room temperature cure for air drying. Easy application by brush or spray. No need of baking for curing. Clean the surface of the pre-treated surface thoroughly from Fingerprints, Debris, Particles, just and contaminate like Rust Soot, Grease, Dust, etc. Application of the coating is conducted under normal temperature and surrounding conditions. Shake well before using the coating solutions. Spray the coating solutions thoroughly on clean surface. Can also be applied with brush. Keep for 10-15 minutes for touch dry. Cured at room temperature for 18 hrs for hard dry best mechanical properties are achieved after 7days. The product can be applied on many appliances like Chimneys, Ovens, Barbeques, Mufflers and Other areas where temperatures are high. It can also be suitable for Stacks, Kilns, Breechings, Burning Stoves, Heat Exchangers, Boilers, Turbine Housing and Most essential piping in industrial plants. Need of SolutionOdor causing bacteria’s including Mold, fungi, Yeasts Virus are more prone in the areas like: Path Labs, Hospitals Nursing Homes, Schools Crèche, Restaurants Public amenities. Even after regular washing cleaning of medical textiles beddings of hotels, hospitals railways with high quality, detergents, chemicals and solvents, We could not been able to kill all the bacteria and could not prevent there ill effects completely.As we are aware that allergies are found in as much as 30 percent in adults and 40 percent in children. These Regular cleaners, Detergents Chemicals which has the cleaning property are not fully equipped with the required anti-bacterial agents. Thus, proper washing cleaning could not protect us fully from the attack of bacterial pathogenic micro organisms. IntroducingStar Bacteria Shield is a highly effective Nano Technology based antimicrobial, disinfecting agent developed for all kinds of medical other cleaning solutions, anti fungal ointments, detergents, soaps washing powders along with fabric textiles. It is plays an important role in the suppression and killing of dozens of pathogenic micro-organisms such as Escherichia coli and Staphylococcus aureus at PPM level (Parts per million). Brief: Star Bacteria Shield is a highly effective Nano Technology based antimicrobial disinfecting solution.It protects from bacterial pathogenic micro organisms.Star Bacteria Shield doesn’t have any kind of acids heavy metals also VOC free.It comes in concentrated form.It is highly effective on all kinds of medical cleaning solutions along with fabric textiles.Star Bacteria Shield prevents odor causing bacterial growth.Star Bacteria Shield excellently works on all kinds of binders softeners.Recommended for washing powders and conditioner.How it WorksStar Bacteria Shield forms a high cross-linked protective anti-bacterial network. It comes in a concentrate form Just 0.5-2% of Star Bacteria Shield is required to be added in all kinds of medical other cleaning solutions, anti fungal ointments, detergents, soaps washing powders along with fabric textiles. Unique PrepositionsStar Bacteria shield is concentrated solution suitable for all type.It has unmatched bacterial and pathogenic protection for wide range of microbes.Star Bacteria shield deactivates the bacteria and prevents the infections.It has No VOC and heavy metals.It is 100% Acid free.Just 0.5-2% of Star Bacteria Shield is required to be added in all kinds of medical other cleaning solutions.Star Bacteria Shield excellently works on all kinds of binders softeners.Easy to apply in hygiene products.How to addJust 0.5-2% of Star Bacteria Shield is required to be added mix uniformly to achieve the optimum level. Percentage of Star Bacteria Shield depends on the required products performance. 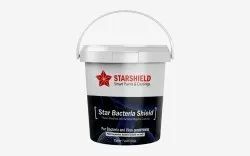 Where to apply: Star Bacteria shield is antimicrobial, disinfecting agent developed for all kinds of medical other cleaning solutions, anti fungal ointments, detergents, soaps washing powders along with fabric textiles.